It's been five years since the Austin, Texas post-rock quartet Explosions in the Sky released their last album "Take Care, Take Care, Take Care" but while the wait might have felt long for some, it has definitely been worth it. 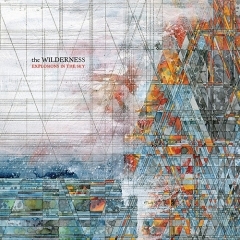 The band continues their instrumental post-rock style on "The Wilderness" while they have also trimmed down their tendency to write long, winding tracks with the longest one here clocking in at seven minutes and fifteen seconds. Still, every song on the new album gets to develop freely and this adds some truly haunting soundscapes to the band's repertoire. Many of the sounds and themes used on the record are dimmed down or electronic and makes the bulk of the songs sound as if we were hearing them under water. This immersion has the effect of making the listener all the more curious and attentive to really pick up the small shifts that happen all the time in the dynamic songs. This doesn't mean that the songs sound thin in any way as many of them are fleshed out with resounding bass and deep reverberating notes underneath that are felt as much as heard when they pulsate through the air. The beginning tracks "Wilderness" and "The Ecstatics" especially lend themselves to that description and both feature carefully stepping main themes buffed up by more swooning, majestic backgrounds. A more dangerous or conflicted vibe is presented first in "Tangle Formations" with a sweeping piano theme and elaborated further in the album highlight "Disintegration Anxiety". Here a cacophonic insistency maintains the song along with main piano riffs that have the melody changing constantly in new and exciting ways while the song is bound together by the scratchy noise that lies underneath. The more ambient side of EITS is also present on this album, especially expressed in the strong flows of "Logic of a Dream" with no explicit rhythm section. In its six and a half minutes, it goes from sweetly dreamy to a nightmarish dissonant build-up and then back to a comforting melody that puts everything in order with an upbeat drum figure. The more noticeable themes and atmospheres aren't as frequent after the fifth song, and while there are still a wealth of details and some solid soundscapes to sink into, it is mostly the first half of the record that really sticks. Still, this album adds some strong tracks to the band's catalogue and it will be most interesting to hear them played live on the band's upcoming European tour.